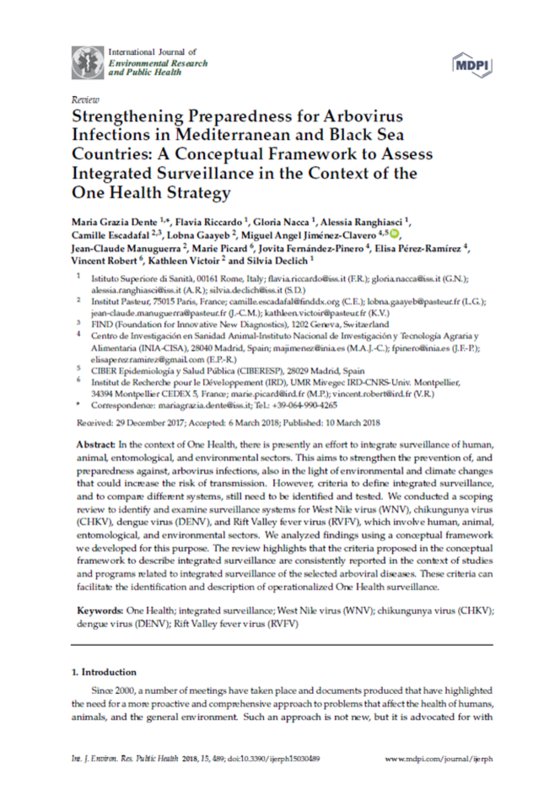 The article entitled “Implementation of the One health approach to fight arbovirus infections in the Mediterranean and Black Sea Region : Assessing integrated surveillance in Serbia, Tunisia and Georgia" is a synthesis of MeSA studies that have been carried out by the MediLabSecure Public Health Working Group, a qualitative situational analysis involving human, animal and entomology sectors of vector borne disease surveillance in three countries of the MediLabSecure network. 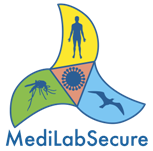 A synthetic chart of current knowledge of the mosquito ditrubtion in the Euro-Mediterranean Region has been carried out within the MediLabSecure network. Entitled "Distribution Chart for Euo-Mediterranean mosquitoes (Western Paleartic Region", this article synthesises published records in the Western Palaearctic region in an updated distribution chart. Identification of vectors is of prime importance in the field of medical entomology for both operational and research purposes. 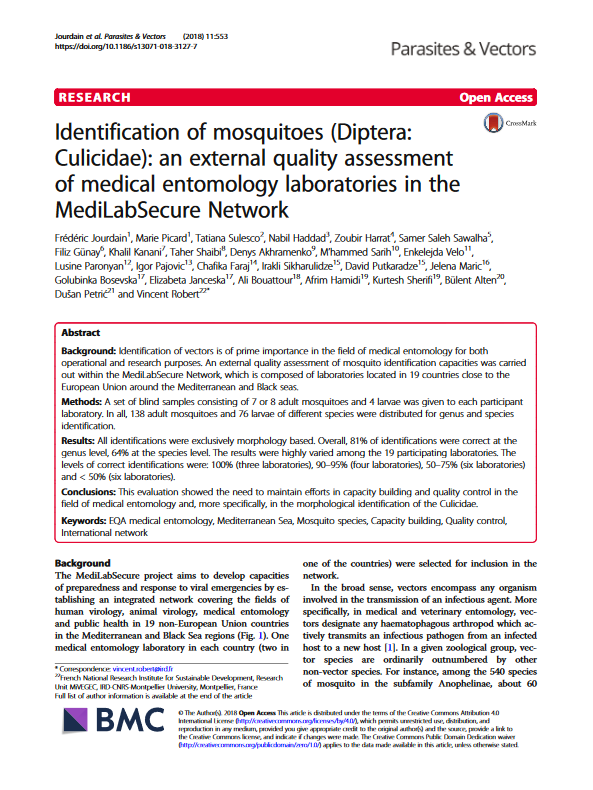 An external quality assessment of mosquito identification capacities was carried out within the MediLabSecure Network, which is composed of laboratories located in 19 countries close to the European Union around the Mediterranean and Black seas. In the context of One Health, Integrated Surveillance of human, animal, entomological, and environmental sectors constitute one of the main challenges to strengthen the prevention of, and preparadness against, arbovirus infections. The article recently published in the International Journal of Environmental Research and Public Health analyses the conceptual framework to assess integrated surveillance in order to facilitate the identification and description of operationalized One Health surveillance. Dente MG, Riccardo F, Nacca G, Ranghiasci A, Escadafal C, Gaayeb L, Jiménez-Clavero MÁ , Manuguerra JC, Picard M, Fernández-Pinero J, Pérez-Ramírez E, Robert V, Victoir K, Declich (2018) Strengthening Preparedness for Arbovirus Infections in Mediterranean and Black Sea Countries: A Conceptual Framework to Assess Integrated Surveillance in the Context of the One Health Strategy, International Journal of Environmental Research and Public Health. 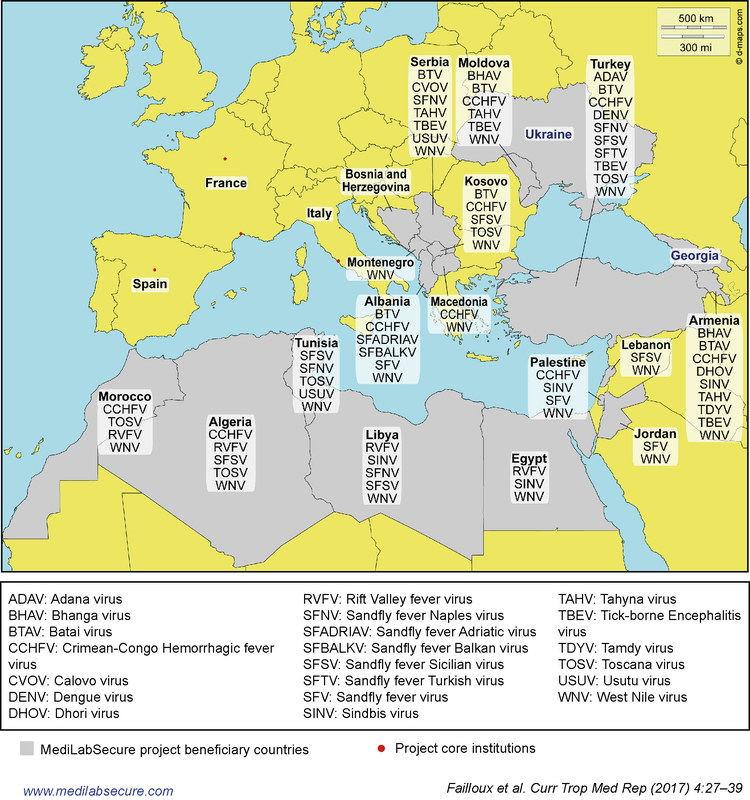 Researchers of the MediLabSecure network have collaboratively mapped arboviruses and their vectors in 16 of the project partner countries in the Balkans, the Middle-East and North Africa. This work underlines the importance of surveillance and the implementation of adapted control strategies of vector-borne diseases in this Region. Source: Failloux, A.-B., Bouattour, A., Faraj, C.,Gunay, F., Haddad, N., Harrat, Z., Jancheska E., Kanani K., Kenawy M.-A., KotaM., Pajovic I., Paronyan L., Petric D., Sarih M., Sawalha S., Shaibi T.,Sherifi K., Sulesco T., Velo E., Gaayeb L., Victoir K. & Robert, V. (2017). Surveillance of Arthropod-Borne Viruses and their Vectors in the Mediterraneanand Black Sea Regions within the MediLabSecure Network. Current Tropical Medicine Reports. Curr Trop Med Rep. 2017;4(1):27-39.doi: 10.1007/s40475-017-0101-y. Epub 2017 Mar 17. The current Zika virus emergence has highlighted the global need to conduct comprehensive risk assessments and develop preparedness activities against arboviral threats. An article published in BMC Public Health examines how the actions and strategies implemented by the MediLabSecure network contribute to the prevention and control of the Zika virus threat in the Euro-Mediterranean area. 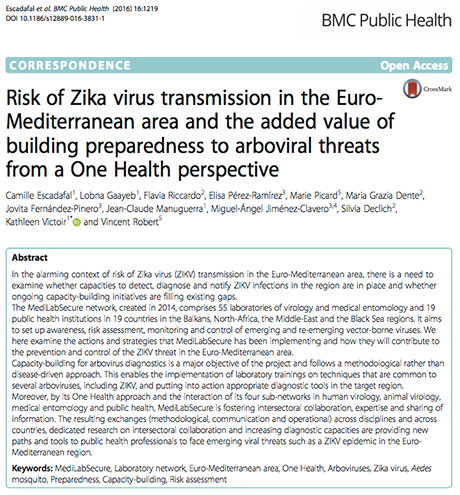 Risk of Zika virus transmission in the Euro-Mediterranean area and the added value of building preparedness to arboviral threats from a One Health perspective. Escadafal C, Gaayeb L, Riccardo F, Pérez-Ramírez E, Picard M4, Dente MG, Fernández-Pinero J, Manuguerra JC, Jiménez-Clavero MÁ, Declich S, Victoir K, Robert V. BMC Public Health. 2016 Dec 3;16(1):1219. 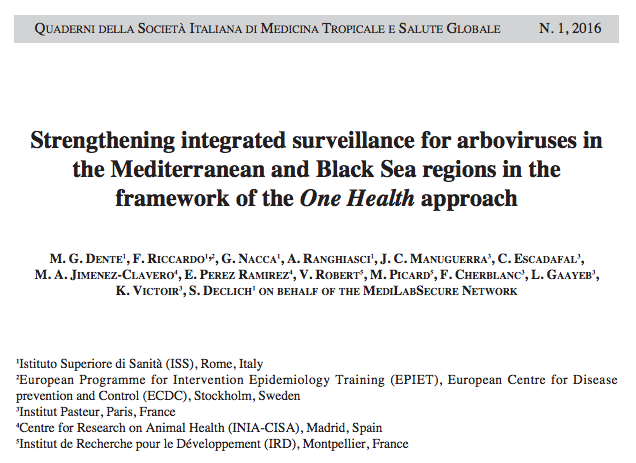 The article entitled “Strengthening integrated surveillance for arboviruses in the Mediterranean and Black Sea regions in the framework of the One Health approach” has just been published. It describes how the MediLabSecure project contributes to the strengthening of One Healthsurveillance in the Mediterranean Basin and Black Sea Regions. You can read and download this article here. 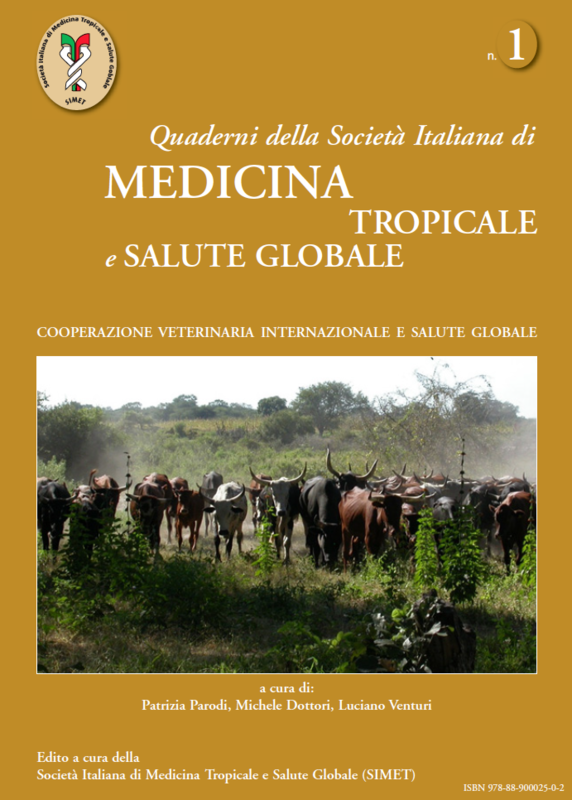 It is part of a monography (with other articles in English) that can be downloaded from the Italian Society of Tropical Medicine and Global Health (SIMET) website.